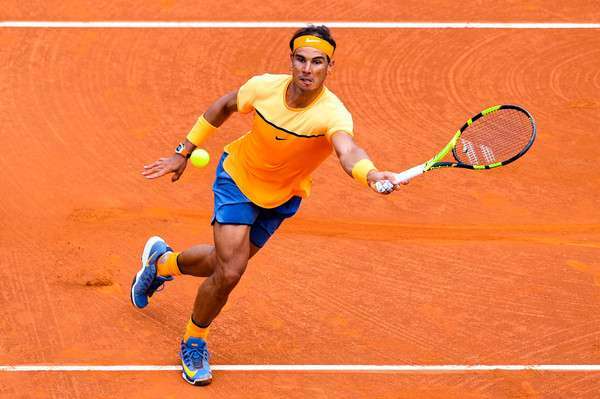 Top seed Rafael Nadal edged closer to a record-extending ninth title at the Barcelona Open Banc Sabadell after booking a berth in the quarter-finals with an easy 6-2, 6-2 win over Albert Montanes on Thursday. The 14-time Grand Slam champion hardly faced any resistance from his compatriot, who he had been beating since the age of 16. He needed just 1 hour 7 minutes to complete the triumph that saw him breaking his 104th ranked opponent’s serve five times. The former World No. 1 now goes on to face his 2015 conqueror Fabio Fognini who handed him his earliest defeat since 2003 when he overpowered the Spaniard in the third round. The Italian, seeded 12th, notched up a comfortable 6-3, 6-2 victory over the eighth seed Viktor Troicki in the third round. Second seed and two-time defending champion Kei Nishikori had a slightly tougher task in the second set as 13th seed Jeremy Chardy made a late surge and broke the Japanese as he served for the match at 6-3, 5-4. But the World No. 6, who has won 12 matches in a row at Real Club de Tenis Barcelona, soon re-grouped and carved out the 6-3, 7-5 win in 1 hour 23 minutes. His next opponent will be the 11th seed Alexandr Dolgopolov, who subdued the 19-year-old rising star Karen Khachanov, 6-4, 7-5. In the other matches of the day, sixth seed Benoit Paire continued his good form by posting a 6-2, 6-4 win over ninth-seeded claycourt expert Pablo Cuevas. 10th seed Philipp Kohlschreiber had a more difficult road to victory as he outlasted the seventh seed Feliciano Lopez, 6(5)-7, 7-5, 6-3. 19-year-old Alexander Zverev’s challenge was ended by Tunisian veteran Malek Jaziri, 7-6(5), 6-4 while 16th seed Andrey Kuznetsov emerged a 6-2, 6-4 winner over qualifier Radek Stepanek. Indian doubles ace Rohan Bopanna’s struggles continued this season as he and Jean-Julien Rojer bowed out of this ATP 500 event in the quarter-finals. The Indo-Dutch pair, seeded fourth, was shown the door 6(5)-7, 4-6 by the unseeded duo of Max Mirnyi and Treat Huey. The World No. 12 Indian will now set his sights on the defence of the title that he won at the Madrid Masters last year with Romanian Florin Mergea.